Increased energy usage is a natural consequence of economic growth and improving living standards in emerging countries. It is important to remember that the internal environment in your home can be affected by the following factors. Shading - Have you maximized the winter sun & minimized the summer sun? 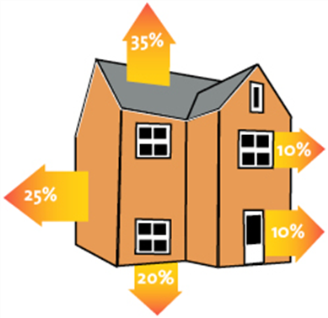 Air Gaps - Are your doors, roof and windows air tight? To properly insulate the ceiling in a typical home costs less than 1% of the total per square meter building costs, yet it is one of the few building materials that will save you money for the lifespan of your home. By adequately insulating your geyser, walls and ceiling you can positively influence 63% of your electricity consumption thus reducing your bills.